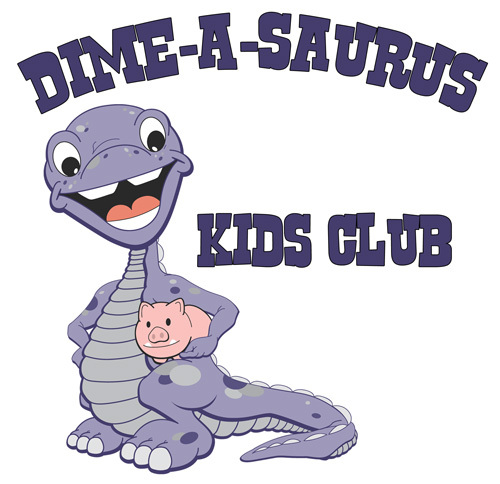 The United Financial Dime-A-Saurus Kids Club is designed to teach kids the value of money by building their own savings accounts. Plus, we make it fun with special promotions and activities. All kids from birth to age twelve are eligible to join the Kids Club. Open and maintain a United Financial Credit Union Savings account with $0.25 or more (You’ll need your Social Security Card, too!) You will also need an adult (someone 18 or older) to be joint on the account. A special prize every time you make a deposit! Junior Savers Day: Every 2nd Wednesday of the month – stop in for treats, double punches and free coin counting! Junior Savers – Monthly Saving Challenge! Each deposit earns you a chance to win a monthly prize! A punch card that’ll help you earn bigger prizes! Keep track of your deposits when you come into the credit union! For each deposit of $2 or more you will receive 1 punch on your card. When your card is full you will receive $10 into your account! Limit 1 card per quarter. The Children’s Online Privacy Protection Act (COPPA) was passed by Congress in October 1998, with a requirement that the Federal Trade Commission (FTC) issue and enforce rules concerning children’s online privacy. The primary goal of the Act and the Rule is to place parents in control over what information is collected from their children online. The Rule was designed to be strong, yet flexible, to protect children while recognizing the dynamic nature of the Internet.